I love free books. 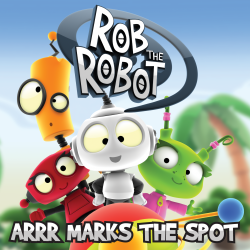 I recently won a copy of Rob the Robot Arr Marks the Spot during 1889 Labs #1889party. After thumbing through the book, I wasn't sure that it was my kind of story, so I decided that my husband would be in charge of reading this one to our daughter. This plan blew up in my face rather quickly. A few nights after getting the book, my husband went out with some friends, and Ava wanted to read the robot book. No biggie, Rob the Robot was the bedtime story. There were a few reasons I figured that this book would bore me, here is a quick list: robots, space travel, pirates, skulls and crossbones, and treasure maps. I sat down with Ava and allowed myself an internal sigh, I would rather have read Fancy Nancy or Little Critter, but I would endure a hunt for treasure because she liked the book. Boy, was I wrong about this book. It was excellent. I already knew that the pictures were incredible from my cursory glance, and after reading it a I noticed more positive qualities. As far as illustrations go, this book can brag bright colors, attention to details, and my favorite, informative illustrations adding details to the story like all good illustrations should. As far as the actual story went, I was also pleasantly surprised. The basic story line is of four robot friends traveling through outer space when they find a bottle floating along the way. In the bottle, of course, is a treasure map with a big X. Obviously, X marks the spot of the treasure. The story, while intense at times and bordering on scary (for a two-year-old), never actually scared my daughter, which as a parent, made me happy. While on their adventure, the robots hear sounds coming from a cave that they believe are a monster. The monster soon turns out to be a giant robot pirate. Yes, a friendly, giant robot pirate. The robots, including the pirate, continue to work together to find the X that marks the spot. Rob the Robot has another bragging right: educational content. The parent and educator inside of me squeals with delight every time I read this book because of the learning potential. Maps, compasses, counting backward, vocabulary with quick, relevant explanation, and my favorite, the use of the word jig, which led my husband to show our daughter what 'dancing a jig' meant. Rob the Robot is colorful, fun, has some learning focuses, and is well written with no glaring grammatical errors or typos. My only irritation with the book was the number of sentences that ended with exclamation points. I felt that the over use detracted from those lines that were really meant to be read with emphasis. That being said, I look forward to reading this with my children for a long time, I just wish there were more Rob the Robot titles to keep us busy. I'm 29 with two kids and a few years experience as a teacher in an elementary school, and I still think I'd fail at writing a kid's book. My sister keeps kicking around an idea for one, and it sounds pretty good. She also has no experience with kids, but is always fun Auntie Ali when she is in town. Indie Author Monique Mensah - Who Is He To You?